We thank our members , non-members for your donations to Indiasudar. To keep the account statement very accurate and to send 80G, the details of donors are very important. 1. When You donate, please mention your member id Or your name in the transaction description. Also, visit www.indiasudar.org then click " Donate" and submit your donation details. Please Visit www.indiasudar.org then click " Donate" and submit your donation details. Please Visit www.indiasudar.org then click " Donate" and submit your donation (details of your friend/relative who donated) details. Indiasudar can not extract the donor details if the transaction description is as mentioned below. We kindly request you to follow this simple process which helps us to prepare account sheet without any delay. We are in need of your kind support to fulfill the requirements of needy. Regular donations will help us better. Kindly consider. Our onsite school – Panchayath Union Middle School, Periyailliam,Kangeyam Block, Tirupur Dt has celebrated annual day 2017 on 17th March 2017. Audio systems , stage arrangement , Pandal (stall) arrangement were taken care by parents. Food was arranged by well wishers from the village. Indiasudar has provided Prizes to motivate best performers (in sports, academic, arts etc) studying 1st std – 8th std in this school. Our member Mr Maniganda prabhu has supported this project. Prizes: Writing Pad, Geometry box, water colour , saving boxes etc. For more details, please refer the attached project report. 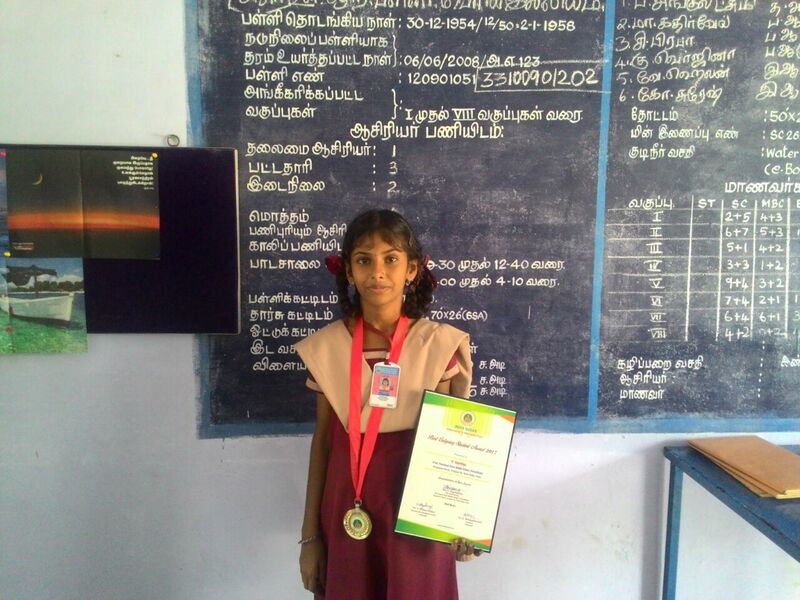 Student Santhiya , 8th std has received Indiasudar Best Outgoing Student Award. We thank our members for the continuous support. We sincerely appreciate the efforts of school teachers and parents community in improving the school. We have attached India Sudar Monthly Account Sheet for the month of September 2016. India Sudar had FCRA certificate (Year 2012 to 2016 for 5 Years) to receive donation from foreign donors and institutions. Now we have decided not to renew our FCRA certificate because we are receiving the donation from three donors only. Even though we receiving the donation from three donors, its required to do separate FCRA tax filling and compliance with FCRA audit process which required more operational activity for our trust. so we decided to raise these required fund from domestic donors itself. But still any Indian (Indian passport holder) very well donate any foreign money to India Sudar domestic account from any country. It’s not required FCRA approval for our organization. From year 2017, we won’t receive any donation from foreigner or foreign institutions through FCRA. Indiasudar has provided certificates and prizes (folders, pouch, books , knee cap, pens) to encourage best performers, volunteers, award winners, achievement in sports from our onsite Govt Hr Sec School Renganathampettai, Karur Dt during republic day celebrations 2017. Please find the attached project report. Thanks to our members for continuous support. Our special appreciations to school teachers for the team work! Indiasudar has been supporting Panchayath Union Middle School, Periyailliam, Tirupur Dt since 2015. Spoken English classes are being conducted by the school with the help of Indiasudar’s Teacher deployment project. Indiasudar teacher Mr Abdul Rahman is visiting this school weekly once and improving students communication skills by many ways like spell check, meaning, conversation, grammar , dictionary usage , phonetics etc. Remarkable achievement: Two students studying 8th std never ever interact with anyone in the school. they feel shy to interact. Now, they have performed a conversation program in English (intra school event) and won the prizes. Recently they conducted special QUIZ program to test English Knowledge of the students. Very good improvement. Indiasudar thanks everyone ( members, teachers and students) behind this project. One year effort of this project added another milestone in Indiasudar. Also, school has arranged a field trip (nearby place) to students to get them exposure on Plastic Recycling , soap manufacturing process. Now school is celebrating annual day function on 17th March 2017. Headmaster invited Indiasudar members for the function. Since the school does not have special fund to conduct annual day, they are raising fund from various sources to meet the expenses. Indiasudar would like to arrange prizes for best performers in academic, sports, English, Discipline etc. Total No of prizes: 80 ( 44 First prizes, 36 second prizes). We request members to come forward and motivate and encourage the village students for their talents and performance. Let us register our footprint in the roadmap of a school development.